President Trump met with his French counterpart Emmanuel Macron on Saturday — a visit that began with a spat as dozens of leaders came together to commemorate the centennial anniversary of World War I's end and all that has since been built between nations in a multilateral world. Just minutes after touching down in Paris on Friday night, Trump tweeted harsh words. "President Macron of France has just suggested that Europe build its own military in order to protect itself from the U.S., China and Russia," he wrote. "Very insulting, but perhaps Europe should first pay its fair share of NATO, which the U.S. subsidizes greatly!" The remark referred to a radio interview that the French president had given earlier in the week. Macron had said that a joint European Union military force was needed to lessen dependency on the United States for defense, especially after Trump announced that he was pulling the United States out of the decades-old Intermediate-Range Nuclear Forces Treaty, a deal that was signed by President Ronald Reagan and Soviet leader Mikhail Gorbachev in 1987. Macron spoke of the need "to protect ourselves with respect to China, Russia and even the United States," in the context of cybersecurity. But on Saturday morning, the French president distanced himself from the tension by welcoming his "good friend" with warm words and gestures. The men shook hands on the steps of the Élysée Palace before beginning talks. 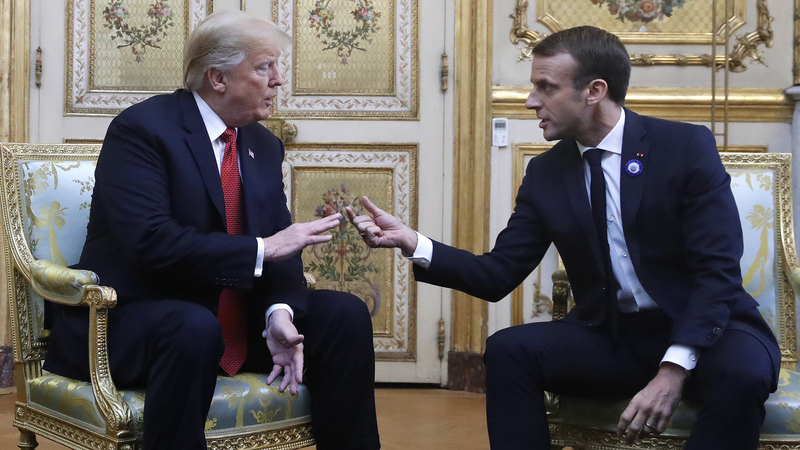 Macron emphasized "the great solidarity between our two nations" and asserted that his perspective coincided with Trump's demand for Europe to pick up some slack in military spending. "I do share President Trump's views that we need a much better burden-sharing within NATO," Macron said, "and that's why I do believe that my proposals for Europe and defense are totally consistent with that because it means more Europe is in NATO and more capacity in order to take our part of the burden." "I appreciate what you're saying about burden sharing," Trump responded. "We want to help Europe, but it has to be fair," Trump added, echoing questions he has previously posed about NATO's future and funding. "Right now, the burden sharing has been largely on the United States as the president will say, and he understands that." Macron agreed. "It's unfair to have European security today being assured just by the United States." When Trump was asked about his tweeted declaration about being insulted, he said, "We're getting along from the standpoint of fairness." Macron's office said that his remarks on the radio "could create confusion" but that Macron "never said we need a European army against the United States," according to France24. "What I find ironic is that Macron is basically just listening to what Trump is telling Europeans," Benjamin Haddad, a fellow at Hudson Institute who worked with Macron's campaign, told NPR. "He's saying he doesn't want Europeans to rely much on the U.S., and that's basically what Macron is saying." Their meeting comes at a time when both presidents face new challenges. A House of Representatives controlled by a defiant Democratic Party awaits Trump in January. In France, Macron's popularity has dwindled because of his "chipping away at the cherished social welfare system" and public missteps, as NPR's Eleanor Beardsley reported. The World War I commemoration comes at a moment in which populist leaders across the globe are promoting nationalism, Theresa May's Britain is attempting to leave the European Union and the United States is pursuing isolation under Trump's America First vision. It was Trump's second visit to Paris since July last year, when he arrived as Macron's guest of honor at Bastille Day celebrations. "I am in Paris getting ready to celebrate the end of World War One," Trump tweeted later Saturday. "Is there anything better to celebrate than the end of a war, in particular that one, which was one of the bloodiest and worst of all time?" "Trump willfully insisted on an unnecessary trip to France to mark the WW1 centenary -then once he got there shirked on grounds of weather the job of honoring those who fought and died in rain and mud 100 years ago," tweeted writer David Frum. "Real low energy," tweeted Kelly Magsamen, once a high-ranking Pentagon official for Asian and Pacific Security Affairs, "to not bother to honor the sacrifice of American soldiers in WWI due to some rain. Somehow everyone else was able to do so today. Obama never had this problem. He also visited our troops in war zones." She then questioned the whereabouts of Russian President Vladimir Putin, Secretary of State Mike Pompeo and national security adviser John Bolton. The president is expected to visit a different cemetery for fallen U.S. soldiers on Sunday.